Easter is an interesting watershed point in the year. No matter whether it falls early or late in the year, it consistently marks the dividing line between when one can wear jeans during daytime hours and when one cannot. This year is no exception; we have officially entered phase one of the Endless Summer. Defining characteristics: windows may be left open in the morning, sun is broiling hot by midday, temperature returns to pleasant as the sun sets. Only gluttons for punishment seen in blue jeans at noon. Although some might say las hermanas y yo son son tan viejas for Easter baskets, we still do them. 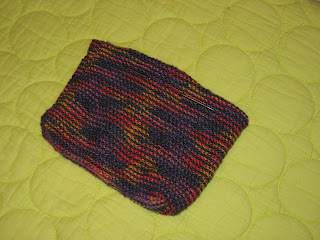 My additions were knitty–squares for Mum and pouches out of favored stash yarns for Hermanita and Monita. Hermanita made me the cutest little woodins. Belle is on the right, and Sebastian is on the left. 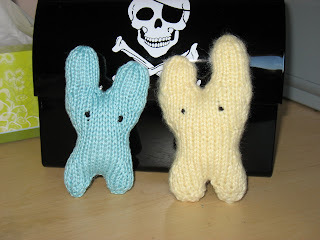 Hermanita did an excellent job, and earned extra points for using my stash yarn to make them. 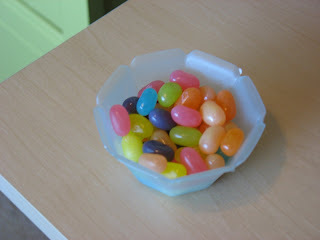 I ate way too many jellybeans over the course of the day, as per usual.